A few years ago, a French café and bakery opened in Guanajuato, Mexico, where I live. Launched by French expats and named La Vie en Rose, “it was a success by the end of its first week,” expat friends told me. 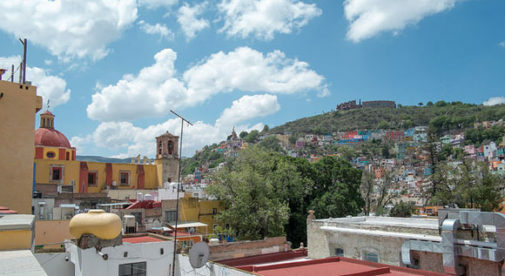 Okay, so maybe they’ve exaggerated just a bit…but certainly by the time I arrived in Guanajuato a few months later, La Vie en Rose was a fixture on the local food scene. It offers good coffee, tea, a variety of French tartes and pastries, and a selection of savory dishes like quiche and pizza. It also lists a lunch and dinner menu on a chalkboard inside, though I’ve never seen anyone order from it. The delectable sweets are what draw most people. It was a case of having the right idea at the right time. We have plenty of shops in Guanajuato that sell traditional Mexican sweets, and we have good coffee shops. But we didn’t have a French patisserie, as our French expats obviously noted. The success of La Vie en Rose reminds me of a café I used to visit when I lived in Campeche, in the Yucatán Peninsula. Chocol’Ha is a chocolatería (chocolate café) housed in a restored colonial home in Campeche’s historic center. It serves good coffee and drinking chocolate, and a few sweet and savory snacks. It also sells local upscale items, from coffee and cocoa, to soaps, shampoos, and hot sauces. I can’t say that Chocol’Ha was as instant a success as La Vie en Rose. But, from the outset, it was the kind of chic café in traditional surroundings that upscale tourists enjoy. And within a few months it, too, became a fixture on the local food scene. In winter I used to go there for hot chocolate; and while I flirted with vanilla or mint flavor from time to time, the hot chocolate with chili, made with water and frothed vigorously, had my heart. In summer I made do with Chocol’Ha’s cold frappes. Chocol’Ha is still going strong—I recently saw on Facebook that it had celebrated its seventh anniversary. Though they’re at opposite ends of Mexico, La Vie en Rose and Chocol’Ha have a few things in common. For one thing, they both took advantage of a gap in the market…a type of café that their owners had seen work elsewhere. And they offer goodies, and an ambience, that appeal to both expats and locals. In Mexico, there are gaps in the market in many fields. Campeche, for instance, had plenty of hotels when I lived there. But it had few houses or apartments that were suitable for short-term vacation rentals. For destinations trying to develop tourism, these are key for attracting longer-term visitors and snowbirds. A few such properties opened over the years I lived there, but they’re still scarce. And it’s a market gap you can look for in any up-and-coming destination. Not interested in managing a property? No worries. Tour services with English-speaking guides…sport-fishing companies in coastal areas…even messenger services. There are expats all over Mexico running a variety of businesses. Opportunity is everywhere…just keep your eyes (and your mind) open to seeing it.